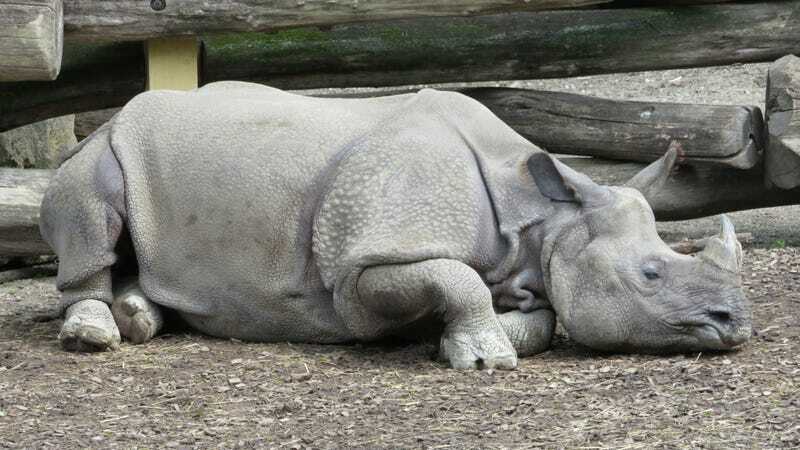 An Indian rhino resting on its belly. Scientists have determined that the way an animal rests—reclining on its back, sprawling on its belly, standing up, or sitting, is determined by primarily by its size. But more importantly, the study authors have provided a large selection of images of animals luxuriating in various ways, and they are delightful. Scientists agree that rest is important, either for “physical recuperation” or for the central nervous system, according to the paper published in the Journal of Mammalogy. But why do animals repose in the way that they do? Previous hypotheses posit that the shape and location of the animal’s digestive system influences the position in which they relax. The team behind the newest work found that the story was more complex than that. They also took a bunch of pictures of zoo animals just having a real mellow time. The researchers observed 253 animals just chillin’ at zoos in Germany and Switzerland during the morning, afternoon, and evening. They recorded the animals standing, sitting, lounging on their backs, flopping on their sides, and lying on their bellies. They compared differences in resting positions to the animals’ digestive types and other data, like their mass. Hippos resting on their bellies. What did they notice? Well, kangaroos always rested on their sides. Peccaries (a pig-like mammal) never laid on their sides. Hippos would sometimes slouch on their sides, but not more than they’d lie belly-down. Ruminants, animals that ferment food in one stomach before digesting it in another (called chewing their cud), never lazed on their sides, since they need to position their digestive tracts properly. Elephants didn’t lie down during the day, but slept on their sides at night. Warthogs relaxed in a sitting posture. As for patterns, the researchers noticed that larger species generally spent more time standing while resting, and smaller species spent more time sitting while resting. Larger animals were also more likely to lean on their sides when they did lie down. In short, they learned that while digestion seems to be a factor in why ruminants don’t lie on their sides, it appears that there are other factors, as well. But again, most importantly, they took a lot of photos of loafing animals which I would now like to share with you. A rock hyrax idling on its chest. Now that’s the chillest elephant I’ve ever seen. A zebra, having a loll. A napping yak. A nyap. Listen, I wouldn’t say I’m the most pro-zoo person in the world, but I much appreciate the scientific greatest hits of lounging animals.